On Ridge Ave at the corner of Ridge and Broadway. Opportunity knocks! Grand old home that has been well maintained. 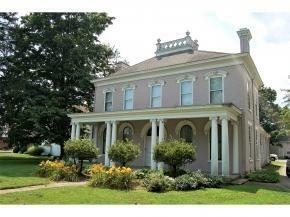 Currently used as a residential, but also has great commercial possibilities. Brick summer kitchen, carriage house. Don't miss out! Taxes are without exemptions and will be much lower once the exemptions are fixed. NOTE: This property was sold on 1/16/2018 and is no longer available. The details listed below are believed accurate to the date of the sale and are subject to change.